SAN TAN VALLEY, AZ – Cade Dillard got his first taste of Keyser Manufacturing Wild West Shootout presented by O’Reilly Auto Parts glory by racing to victory lane in the fifth of six rounds of the 13th Annual event on Saturday night atop the 1/3-mile FK Rod Ends Arizona Speedway clay oval. While Dillard took the spotlight amidst on-and-off light rain, Cole Searing added another X Modified triumph while the Modified feature was ultimately postponed to Sunday’s finale due to persistent light showers that rendered track conditions unsafe to race upon. In the 40-lap Black Diamond Super Late Models presented by M&W Transport feature event, Bobby Pierce battled into the early from the front row outside and appeared poised to capture a fourth Wild West Shootout win of the week that would have pushed his Keyser Quarter Million bonus from $10,000 to $25,000 with the potential to make it a cool $100K with another triumph in the Sunday finale. The storyline made a dramatic shift after 18 laps however when Pierce came to a stop in turn four with a cut right rear tire. Suddenly, after battling past Hudson O’Neal for second a half-dozen rounds early, Dillard found himself in the driver’s seat. And, he didn’t squander the opportunity, even with the legendary Scott Bloomquist giving chase. Racing through traffic over the final 15 rounds, Bloomquist’s best opportunity came on the 35th lap when Dillard’s momentum was briefly interrupted by a lapped car. Bloomquist pulled alongside on the backstretch, but Dillard countered adeptly and made a couple of swift moves through traffic to put the win away. Bloomquist settled for second with O’Neal filling out the podium with his second third-place finish of the mini-series. After winning the matinee feature earlier in the day, Canadian Ricky Weiss was fourth with Brandon Sheppard rounding out the top five. After putting on a new right rear tire, Pierce started at the tail of the field and rallied through the pack to salvage a ninth-place finish that gives him an 18-point advantage over Sheppard in Wild West Shootout points going into Sunday’s $14,000-to-win Shaw Trucking finale. In the 20-lap RHRSwag.com X-Mods presented by Barnett Harley-Davidson feature event, Huron, South Dakota’s weathered a mid-race rain interruption and then collected his third win of the week after starting sixth. Searing was chased to the line by Josh Cain with Skyler Smith, Jason VandeKamp and Steve Muilenburg among the top five. With five podiums in as many events including the three wins, Searing takes a 37-point lead over Cain going into Sunday’s finale as he seeks a second consecutive Wild West Shootout championship. The Mesilla Valley Transportation/Border International Modifieds presented by Arizona Differential were set to cap off the evening with Ricky Thornton, Jr., and Alex Guthmiller leading the 25-lap feature field to the green flag. However, persistent showers forced the postponement of the event to Sunday’s finale. Sunday’s 13th Annual Wild West Shootout wraps up at FK Rod Ends Arizona Speedway with cars taking to the track for hot laps and Late Model qualifying at 3:00 p.m. before making up Saturday night’s Modified “A” Main and then transition into the Shaw Trucking Sunday night finale. 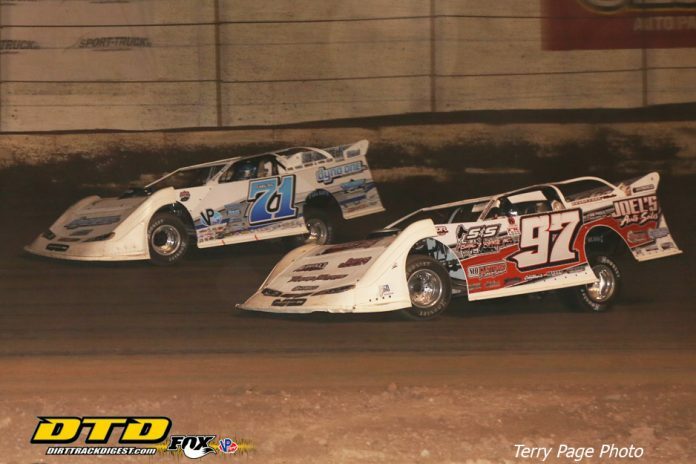 After five rounds of $5,000-to-win Super Late Model feature events, Sunday’s Shaw Trucking finale offers up a $14,000-to-win payday for the victor. Group 1: 1. 1p-Earl Pearson, Jr. 15.379, 2. 86-Kyle Beard 15.440, 3. 71-Hudson O’Neal 15.517, 4. 7-Ricky Weiss 15.547, 5. 17-Billy Franklin 15.603, 6. 91p-Jason Papich 15.636, 7. 91-Tony Toste 15.696, 8. 3x-Lyndon Bolt 15.879, 9. 23-Brad Williams 16.507, 10. 78s-Steve Stultz 16.662, 11. 7w-Richard Wallace 16.764. Group 2: 1. 32p-Bobby Pierce 15.257, 2. 18-Chase Junghans 15.315, 3. B5-Brandon Sheppard 15.413, 4. 42s-Don Shaw 15.495, 5. 71c-R.C. Whitwell 15.567, 6. 942-Terry Casey 15.572, 7. 20v-Rece Vaught 15.691, 8. 44-Cole Schill 16.280, 9. 14m-Dean Moore 16.288, 10. 38-Thomas Hunziker 16.378, 11. 10n-Rob Sanders 16.524. Group 3: 1. 97-Cade Dillard 15.496, 2. 1g-Garrett Alberson 15.541, 3. 7mm-Michael Maresca 15.627, 4. 0-Scott Bloomquist 15.712, 5. 6rt-Ricky Thornton, Jr. 15.734, 6. 15v-Kolby Vandenbergh 15.779, 7. 32b-Cody Laney 15.780, 8. 6T-Terry Carter 15.924, 9. 75-Terry Phillips 16.082, 10. 28c-John Cornell 16.227, 11. 83-Dennis Souza 17.798. Group 4: 1. 28m-Jimmy Mars 15.352, 2. 51-Joey Moriarty 15.401, 3. 2-Brandon Overton 15.477, 4. 2s-Stormy Scott 15.549, 5. 32-Chris Simpson 15.582, 6. 11-Pat Doar 15.736, 7. 76-Blair Northdurft 16.148, 8. 37-Rob Mayea 16.329, 9. 24-Rick Ortega 17.190, 10. 44L-Brandon Lewis 17.976. Heat One (8 Laps): 1. 71-Hudson O’Neal, 2. 7-Ricky Weiss, 3. 1p-Earl Pearson, Jr., 4. 86-Kyle Beard, 5. 91p-Jason Papich, 6. 17-Billy Franklin, 7. 91-Tony Toste, 8. 3x-Lyndon Bolt, 9. 78s-Steve Stultz, 10. 23-Brad Williams, 11. 7w-Richard Wallace. Heat Two (8 Laps): 1. 32p-Bobby Pierce, 2. B5-Brandon Sheppard, 3. 18-Chase Junghans, 4. 71rc-R.C. Whitwell, 5. 942-Terry Casey, 6. 20v-Rece Vaught, 7. 44-Cole Schill, 8. 10n-Rob Sanders, 9. 42s-Don Shaw, 10. 14m-Dean Moore, 11. 38-Thomas Hunziker. Heat Three (8 Laps): 1. 97-Cade Dillard, 2. 0-Scott Bloomquist, 3. 1g-Garrett Alberson, 4. 75-Terry Phillips, 5. 6rt-Ricky Thornton, Jr., 6. 7mm-Michael Maresca, 7. 15v-Kolby Vandenbergh, 8. 32b-Cody Laney, 9. 28c-John Cornell, 10. 6T-Terry Carter, 11. 83-Dennis Souza. Heat Four (8 Laps): 1. 28m-Jimmy Mars, 2. 2-Brandon Overton, 3. 32-Chris Simpson, 4. 51-Joey Moriarty, 5. 2s-Stormy Scott, 6. 11-Pat Doar, 7. 37-Rob Mayea, 8. 76-Blair Northdurft, 9. 24-Rick Ortega, 10. 44L-Brandon Lewis. First “B” Main (12 Laps): 1. 6rt-Ricky Thornton, Jr., 2. 91p-Jason Papich, 3. 7mm-Michael Maresca, 4. 91-Tony Toste, 5. 32b-Cody Laney, 6. 15v-Kolby Vandenbergh, 7. 17-Billy Franklin, 8. 28c-John Cornell, 9. 23-Brad Williams, 10. 78s-Steve Stultz, 11. 3x-Lyndon Bolt, 12. 6T-Terry Carter, 13. 7w-Richard Wallace, 14. 83-Dennis Souza. Second “B” Main (12 Laps): 1. 2s-Stormy Scott, 2. 42s-Don Shaw, 3. 942-Terry Casey, 4. 44-Cole Schill, 5. 11-Pat Doar, 6. 76-Blair Northdurft, 7. 38-Thomas Hunziker, 8. 37-Rob Mayea, 9. 24-Rick Ortega, 10. 14m-Dean Moore, 11. 10n-Rob Sanders, 12. 44L-Brandon Lewis, 13. 20v-Rece Vaught. “A” Main (40 Laps): 1. 97-Cade Dillard, 2. 0-Scott Bloomquist, 3. 71-Hudson O’Neal, 4. 7-Ricky Weiss, 5. B5-Brandon Sheppard, 6. 18-Chase Junghans, 7. 2-Brandon Overton, 8. 86-Kyle Beard, 9. 32b-Bobby Pierce, 10. 1p-Earl Pearson, Jr., 11. 71rc-R.C. Whitwell, 12. 1g-Garrett Alberson, 13. 2s-Stormy Scott, 14. 75-Terry Phillips, 15. 42s-Don Shaw, 16. 44-Cole Schill, 17. 32-Chris Simpson, 18. 51-Joey Moriarty, 19. 7mm-Michael Maresca, 20. 91-Tony Toste, 21. 91p-Jason Papich, 22. 6rt-Ricky Thornton, Jr., 23. 28m-Jimmy Mars, 24. 942-Terry Casey. Heat One (8 Laps): 1. 442-Darrell Nelson, 2. J17-Jacob Gallardo, 3. 51-Alex Guthmiller, 4. 6-Casey Skyberg, 5. 17-Stoney Kruk, 6. 7-Ken McCleskey, 7. 71k-Kenny Wallace, 8. 54-Carlos Ahumada, Sr., 9. 5k-Chaz Baca, 10. 22-Davey Mills, 11. 57-Duke Erickson (DNS), 12. 98-Alex Stanford (DNS). Heat Two (8 Laps): 1. 20rt-Ricky Thornton, Jr., 2. 30-Matt Leer, 3. 4w-Tyler Wolff, 4. 02-Kody Scholpp, 5. 33-Steve Muilenberg, 6. 131-Royal Jones, 7. G17-Fito Gallardo, 8. 9-Jimmy Ray, 9. 6d-Dylan Goplen, 10. 18k-Jacob Pace, 11. 10c-Chad Olson, 12. 77x-Austin Kuehl (DNS). Heat Three (8 Laps): 1. 20-Rodney Sanders, 2. 18z-Zane Devilbiss, 3. 65x-Carlos Ahumada, 4. 75-Cody Skytland, 5. 86-Kyle Beard, 6. 32-D.J. Shannon, 7. 4R-Dereck Ramirez, 8. 9L-Vncent Lucas, 9. 2-Don Gumke, 10. 71-Jessie Hoskins, 11. 8a-Al Giesbrecht. Heat Four (8 Laps): 1. 2a-Casey Arneson, 2. 91-Joe Duvall, 3. 111-Bumper Jones, 4. 1tpo-Tyler Peterson, 5. 71s-Dustin Strand, 6. 5b-Brenda Kirby, 7. 19sb-Lance Mari, 8. D25-David Tanner, 9. 44-Christy Barnett, 10. 36-Ryan Cousins, 11. 4-Blake Higginbotham. First “B” Main (12 Laps): 1. 32-D.J. Shannon, 2. 19sb-Lance Mari, 3. 71s-Dustin Strand, 4. G17-Fito Gallardo, 5. 44-Christy Bennett, 6. 33-Steve Muilenberg, 7. 2-Don Gumke, 8. 57-Duke Erickson, 9. 5b-Brenda Kirby, 10. 18k-Jacob Pace. DNS: 54-Carlos Ahumada, Sr., 9L-Vincent Lucas, 36-Ryan Cousins, 71-Jessie Hoskins, 8a-Al Giesbrecht. Second “B” Main (12 Laps): 1. 4R-Dereck Ramirez, 2. 9-Jimmy Ray, 3. 17-Stoney Kruk, 4. 5k-Chaz Baca, 5. 10c-Chad Olson, 6. D25-David Tanner, 7. 131-Royal Jones, 8. 1tpo-Tyler Peterson, 9. 7-Ken McCleskey. DNS: 71k-Kenny Wallace, 6d-Dylan Goplen, 22-Davey Mills, 4-Blake Higginbotham, 77x-Austin Kuehl, 98-Alex Stanford. “A” Main (25 Laps): Postponed to Sunday, January 13, 2019, by rain. Heat One (8 Laps): 1. 27x-Kalvin Iverson, 2. 16-Jason VandeKamp, 3. 44JT-Jaime Torres, 4. 34-Troy Randall, 5. 2g-Brock Gronwold, 6. 19-Lucas Rodin, 7. 8n-Nick Rivera, 8. 32-Eric Haugland, 9. 17e-Neil Eckert, 10. 27c-Dave Cain, 11. 07-Donovan Flores, 12. 5c-Preston Carr. Heat Two (8 Laps): 1. 16x-Skyler Smith, 2. 39-Steve Muilenberg, 3. 1s-Scott Bintz, 4. 97-Coleman Anderson, 5. 6c-Kalvin Caitlin, 6. 10c-Cole Haugland, 7. 99-Jamie Thorstad, 8. 141-Clint Jensen, 9. 15-Speedy Madrid, 10. 171-Jed Smith, 11. US-Jonathan Olmscheid. Heat Three (8 Laps): 1. 97x-Don Schaefer, 2. 19d-Dane Durbin, 3. 80-Gerald Vesel, 4. 30-D.J. Tesch, 5. 777-Mike Rosales, 6. 88-Nathan Smith, 7. 7b-Bailey Cousins, 8. 57-Nathan Higginbotham, 9. 65-Ron Reed, 10. 56-Terry Bahr, 11. 22-Matt Heinzerling. Heat Four (8 Laps): 1. 3J-Josh Cain, 2. 10-Cole Searing, 3. 0-Matt Gilbertson, 4. 44-Austin Hunter, 5. 20-Austin Ellis, 6. 17-Lance Schill, 7. 15s-Wade Skinderlein, 8. 81x-Matt Spardy, 9. 17x-Rob Moseley, 10. 37x-Skeeter Estey, 11. 41J-Josh Jensen. First “B” Main (10 Laps): 1. 5c-Preston Carr, 2. 777-Mike Rosales, 3. 1s-Scott Bintz, 4. 10c-Cole Haugland, 5. 32-Eric Haugland, 6. 20-Austin Ellis, 7. 15s-Wade Skinderlein, 8. 81x-Matt Spardy, 9. 15-Speedy Madrid, 10. 65-Ron Reed, 11. 22-Matt Heinzerling, 12. 17e-Neil Eckert. DNS: 141-Clint Jensen, 171-Jed Smith, 41J-Josh Jensen. Second “B” Main (10 Laps): 1. 37x-Skeeter Estey, 2. 19-Lucas Rodin, 3. 2g-Brock Gronwold, 4. 0-Matt Gilbertson, 5. 8n-Nick Rivera, 6. 27c-Dave Cain, 7. 07-Donovan Flores, 8. US-Jonathan Olmscheid, 9. 17x-Rob Moseley, 10. 56-Terry Bahr, 11. 7b-Bailey Cousins, 12. 34-Troy Randall, 57-Nathan Higginbotham. DNS: 99-Jamie Thorstad. “A” Main (20 Laps): 1. 10-Cole Searing, 2. 3J-Josh Cain, 3. 16x-Skyler Smith, 4. 16-Jason VandeKamp, 5. 39-Steve Muilenberg, 6. 97-Coleman Anderson, 7. 2g-Brock Gronwold, 8. 37x-Skeeter Estey, 9. 10c-Cole Haugland, 10. 19-Lucas Rodin, 11. 97x-Don Schaefer, 12. 44-Austin Hunter, 13. 30-D.J. Tesch, 14. 19d-Dane Durbin, 15. 27x-Kalvin Iverson, 16. 44JT-Jaime Torres, 17. 6c-Kalvin Caitlin, 18. 80-Gerald Vesel, 19. 777-Mike Rosales, 20. 0-Matt Gilbertson, 21. 17-Lance Schill, 22. 1s-Scott Bintz, 23. 5c-Preston Carr, 24. 88-Nathan Smith.